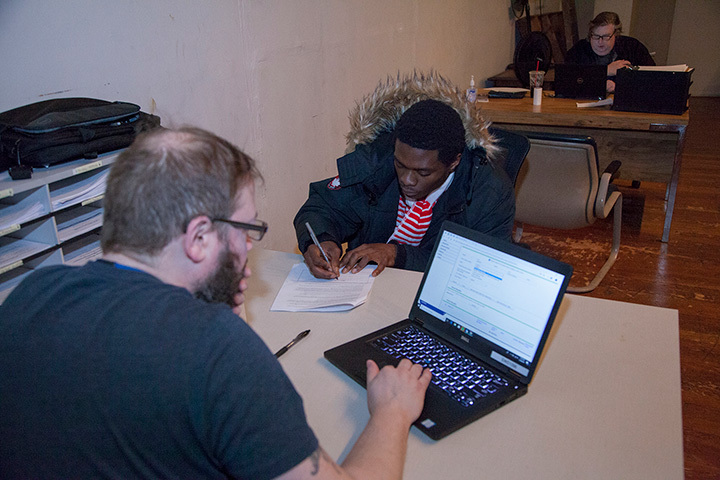 At the NOAH Project, CAM Intake Specialist Brian Brosch searches for a shelter bed for Stephen O., who is filling out forms to assess his housing needs. The bitter cold was moving toward the city, and Stephen O. needed shelter for the night and for days to come. He’d recently spent several days in a psychiatric hospital to treat his schizophrenia. Stephen has been without stable housing for nine months after dropping out of community college. He’d stayed with various friends and family, but those options were now exhausted, Stephen felt. Stephen came to the NOAH Project, inside Central United Methodist Church near Comerica Park. 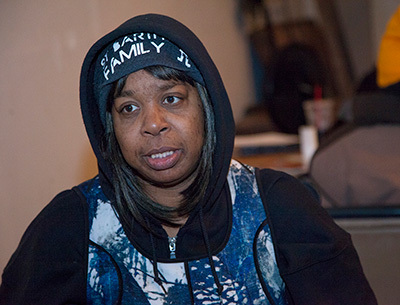 The NOAH Project is one of the “Access Points” for the system that helps individuals and families experiencing homelessness access available shelter and housing resources in Detroit, Highland Park and Hamtramck. This system is known as the Coordinated Assessment Model (CAM). Southwest Solutions is the lead agency to implement CAM. CAM Intake Specialist Brian Brosch works with Stephen O. at the NOAH Project. At NOAH, Stephen met with Brian Brosch, a CAM Intake Specialist. 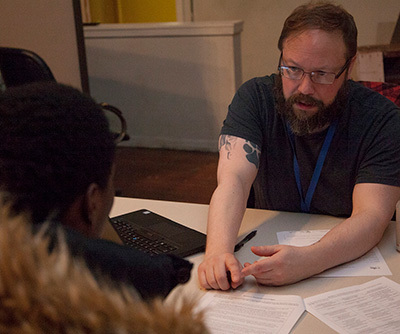 Brian interviewed Stephen about his immediate housing needs and had him fill out the forms to help assess his eligibility for permanent housing down the line. Brian looked at the CAM database of currently available beds at shelters. There was a spot available at the Tumaini Center, run by Neighborhood Service Organization (NSO), and Brian asked Stephen if he’d like him to make the arrangements to go there. The CAM Access Point model was fully implemented about a year ago. Before then, CAM operated a call center for people experiencing homelessness to contact in order to be connected with housing resources. The call center number (313-305-0311) is still operational as an automated system to direct people to the appropriate Access Point. Because of high demand, the shelter system in the city is stressed and limited beds are available. The stress intensifies when freezing temperatures pose a threat to life and limb. Melissa W., who is homeless and seeking permanent housing, at the CAM Access Point at the NOAH Project. In the last three months of last year, CAM intake staff made about 1,600 referrals to emergency shelters or housing programs. Almost 90% of these referrals were to shelters. Last year, CAM referred a total of 584 households to permanent housing programs. The Access Point model requires that individuals and families come to those sites to be serviced. The model is supplemented by three street outreach teams operated by the NOAH Project, NSO, and Cass Community Social Services, respectively. These outreach teams rotate working nights. They closely coordinate with shelters, so that if an individual is willing to come off the streets, the outreach team will get them to an appropriate place. Police and other authorities are well aware of the teams and can readily contact them if needed to assist homeless persons. More information is available at www.camdetroit.org.